Today is the first ever quarterly reveal for quilts made by The Endeavourers. You can find all the quilts gathered together on our joint blog, together with WIP posts and thoughts about the theme, which, this quarter, is nature. What a great theme to get started with! I liked the idea of the drama of forces of nature, and I thought of the phrase "Nature, red in tooth and claw" which would have lent itself to something interesting but possibly rather gory! But nature to me a source of happiness and interest, so I abandoned those lines of thought and I'd been mulling over various ideas when I looked out of my dining room window and saw a beautiful male blackbird sitting in a very healthy Cotoneaster bush, covered with red berries, which is in the garden below. I live in the city, and I love that even among all the buildings and industry nature is all around! So that, right there, was my inspiration and here is my blackbird sitting in its cotoneaster on a winter day, representing the natural world. 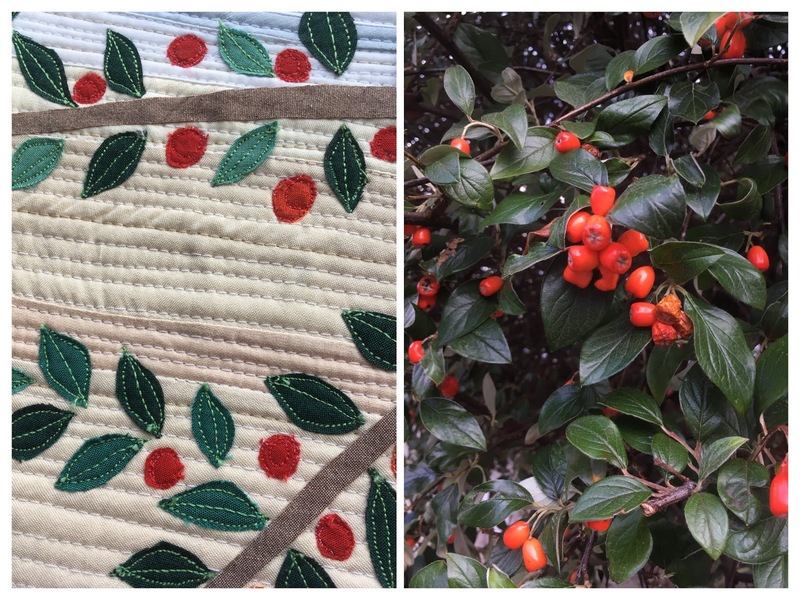 I decided to make the most of the wintery sky which is made using curved piecing, heavily quilted, and the blackbird and branches are raw-edge applique, which was then free-motion embroidered to add detail and fix it in place. Apart from the winter sun which is pieced with gold silk, I used shot cottons from Oakshott which are ideal for works like this because the different warp and weft give subtle variations in colour rather than being solid, and this quality is perfect for anything from the natural world. The centre of the blackbird's eye is a small black bead sewn on with white wool thread to make the eye sparkle. I wanted my image to be stylized rather than hyper-realistic so I have not filled in the fine detail in the image but have left it so that you can mentally join the dots. In the past I have done a fair bit of printing and I'm drawn to more graphic images. There are no 'new-to-me' techniques in this quilt so it wasn't very adventurous, but my quilts have more often than not been abstract so it's been good to make something pictorial! Please do visit The Endeavourers - you should be able to find all our works together by the end of today, and from each post be able to visit each participant's own blog for more detail. I'm really looking forward to seeing what inspired everyone, and how they interpreted the theme. I especially like your background fabric and stitching. Do you use a curved ruler when cutting the pieces? You have certainly perfected your technique. I agree with KC's Court. This IS stunning. Hi Carol - Thank you! I don't use a ruler, so I thought I would make a bit of a process post in the next couple of days. This is really beautiful Catherine. I love the detail that you have included without making the final piece cluttered. Another triumph! Your piece is very nice. The sky is so nicely done. Lovely, Catherine! Your sky looks great, but difficult to stitch I imagine. Look forward to reading more on how it’s done. I’m having trouble posting on the Endeavourers blog page. When it says to go tothe top of the page and hit new post, mine does not say that. It has my email and dashboard and sign out. When I sign out it just leaves the page. Any suggestion? Inspiration comes when we least expect it. What a beautiful piece of art you created. The curve piecing and heavy quilting is amazing. Love it. I love our blackbird picture, and the background (sky) is wonderful! When we lived in Los Angles, I used to perk up at the sound of a bird chirping. Your beautiful blackbird, representing the natural world in the city, made me think of that. I love how you quilted the background, but left the beautiful bird untouched. Your mini looks very much like a painting, Catherine. This is a lovely mini quilt, Catherine. Your blackbird sitting on the cotoneaster branch is sweet. Love the effect of the sun sitting in the wintry sky. Fabulous quilting! I have had the best time reading this post and your previous two, with your wrap-up of the prior art group themes and your pieces. The gold silk really comes out looking like gilding, doesn't it? Absolutely beautiful. I love how you handled the sky - very wintry but he warmth of the red with the green really gives it a rich feel. We don't get to enjoy blackbirds very much in our garden. Charly our Jack russell will put up with a robin, be wary of a magpie but will fly at every blackbird especially the female ones and chase them off. Must be the shape I guess that triggers a switch in her brain!